Greetings! Recently I had the privilege of spending a few days in Seattle with Lino Tagliapietra and his grandson, Jacopo Vecchiato, a talented young man who is the manager of Lino’s business. During the time that I was there I was able to see most of Lino’s available inventory and choose some really great pieces. It has taken a while for all of the inventory to be photographed and cataloged and I have just updated the Available Works page of my website with nearly all new inventory. I am so excited about this great selection that I have decided to devote the entire September issue of Holsten Galleries News to Lino and his work. Most of you are already aware of Lino’s place in the world of contemporary glass art and the story of his origins. For those of you who are not, I’d like to offer a brief recap here. Lino was born on the island of Murano, a neighboring island of Venice, in 1934. At the age of 11 he began working in a series of Murano glass factories and by his early twenties he was granted the title of Maestro. Although he continued working in some of the most prestigious glass factories for several decades he also increasingly expressed his own forms of creativity though the design and execution of many beautiful works. During the 1980’s Lino became more and more independent and since 1990 he has been a free practicing artist. 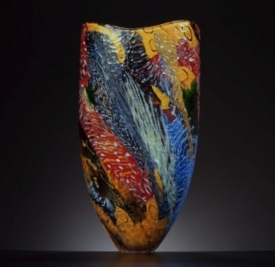 Lino became very well known among American glass artists in the 1980’s by teaching several times at Pilchuck Glass School, north of Seattle, and through his collaboration with many other glass artists including Dan Dailey and Dale Chihuly. 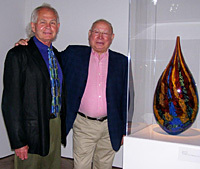 Lino is credited and appreciated for bringing the ancient Murano techniques and standards of excellence to the American studio glass movement and he, in turn, was inspired by the experimental and creative spirit of American glass artists. 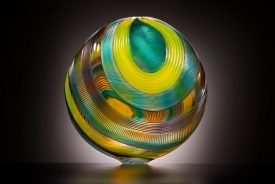 Since 2000 or so Lino has been widely recognized as the world’s greatest living glassblower. He has won numerous awards, including two honorary doctorates. I was fortunate enough to be present for the first of these awards in 2004 at Centre College in Danville, Kentucky, where Lino’s close friend Stephen Powell is a Professor of Art. Interestingly, Judge Sandra Day O’Connor was one of the other recipients. Lino also has works in many leading museums including the Metropolitan Museum of Art in New York, the Victoria and Albert Museum in London and the De Young Museum in San Francisco. 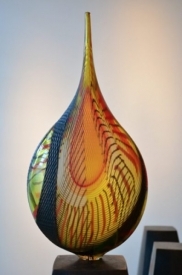 Today, at age 81, Lino still blows his own work, along with a team of other talented glass artists, and is creating some of the most spectacular pieces of his long and distinguished career. I am proud to have represented Lino since the late 1980’s and to call him a close friend! Please take a moment to see the entire selection of Lino’s new work at this link. As always, I welcome your questions and comments. I hope you and your loved ones have a wonderful autumn season!